A couple of months ago I realised that I had two games in my bag with a similar theme. Both Key West and Sun, Sea & Sand were launched at Spiel last year and both are about developing tourist resorts. However, each approaches the subject differently and the result is two markedly different games. I thought I should review them together, allowing me to compare and contrast the two games’ approaches and their styles. 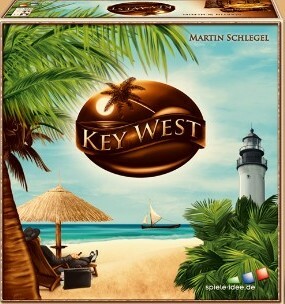 Key West comes from designer Martin Schlegel, best known to me as the man behind the clever card game John Silver and the ingenious Aqua Romana amongst many other games. 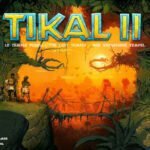 Published by Spiele-Idee, the game is about the development of the Florida Keys. 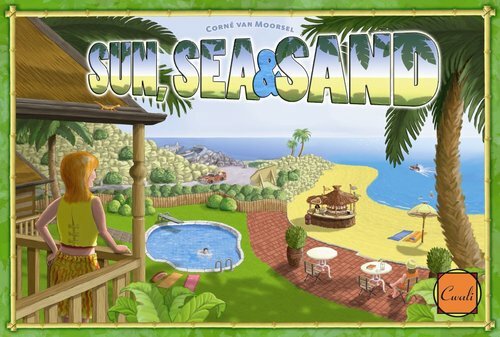 Sun, Sea & Sand was designed by Corné van Moorsel and published by his imprint, Cwali Games, which has a lengthy pedigree too. The first contrast is that Sun, Sea & Sand has players developing their own resort on a single island. Key West comes in a deep, square box. Its square board shows the chain of islands and the Florida coast. Also on the board are boxes for the actions players can take, a grid of squares for diving trips and a grid for the value of wrecks plus tracks for victory points and cigar production. By contrast, the smaller, shallow box of Sun, Sea & Sand contains plenty of brightly-coloured cardboard pieces, but no board as such. Instead, each player has a board for their resort. There are a couple of small, shared boards, which go round the key element: the boats that bring tourists to the island. 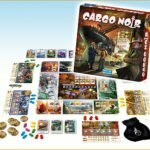 Both games have plenty of other pieces in the box. Key West has lots of cardboard tiles. The smaller square ones are diving tiles. Shuffled, they are laid out on the board for players to turn over when they go diving. 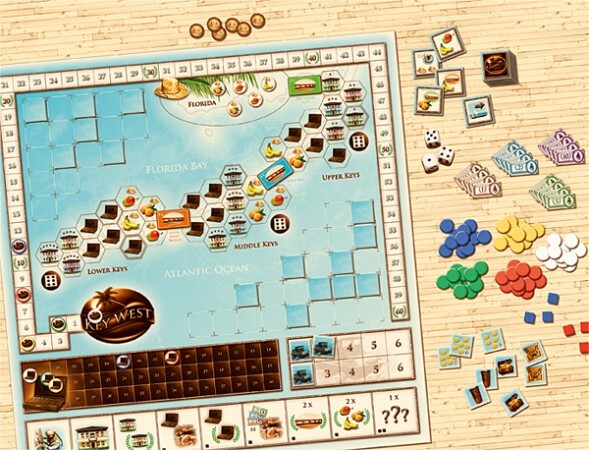 The larger square tiles, the ‘Key West’ tiles, show bonuses or actions for players and are the subject of an auction at the beginning of each turn. Round tokens show which crops can be harvested and the rectangular ones are money, in several denominations. Each player gets a set of wooden discs and cubes in their chosen colour to mark their actions and what they own on the board. They also have markers for the victory point and cigar production tracks. 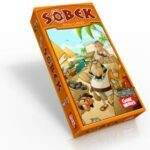 Sun, Sea & Sand has a lot of cardboard tiles, too. Most of these are sets of the attractions that players can buy for their resort—colour-coded (red, blue, green and yellow) for the section of the resort board they go on. There are then the neutral “chalet” pieces, “beaches” that go between the players, hotel signs and the all-important boats, divided into sections that show a number of tourists. 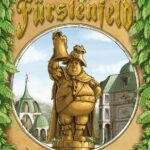 The tourists themselves are wooden figures (meeples) in the four colours—each colour is also a different shape. One of the small central boards is for the attractions, showing the escalating prices as players buy through the set of tiles. The other has a track to show players’ money around a central space that is a time track. Players have five wooden markers in their colour for their ‘family members’ and a cardboard chit to mark their money. And, in a nice touch, the start player marker is a real seashell! Both games are played over eight turns. At the end of this, players tot up their victory points and the player with the most points wins. In each turn, players carry out actions from those available to them. The actions are, of course, very different in the two games, as are the ways in which players’ choices are limited. In Key West there are eight possible actions. Players carry out two in their turn, marking what they choose with one of their cubes. Players have six of these and use them over three turns, unable to re-visit an action they have already taken (though a ninth option allows them to use both cubes in one turn to repeat an action). This puts a premium on planning. Not just for this turn, but for sets of three: which actions do you want to perform and in which order? What can change this is the auction at the beginning of the turn. 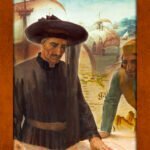 Six “Key West” tiles are turned face up: these give players bonuses (such as turning over extra tiles when they go diving) or opportunities (buying a plantation, for example). This is a sealed bid auction: players put money in their closed hand, revealing their bid once everybody has bid. The highest bidder takes two of the tiles. 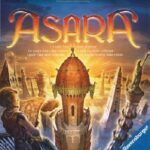 Depending on the number of players, other player(s) will take a tile or two as well. The lowest bidder is first player for the rest of the turn. Players keep the money they bid, except for the high bidder, who must pay the low bidder the value of the low bid. This is a neat mechanism. To get a benefit from being low bidder, you must bid something. However, you then run the risk of not being low bidder after all! Conversely, if you want to win the auction, you can bid all your money, secure in knowing that you will keep some of it. Though possibly not very much if everybody bids high! In Sun, Sea & Sand, you take actions with your “family member” pieces, buying signs, chalets or attractions for your resort. Depending on the action, you put the piece on the time track one, two or three weeks away. At the end of the turn, you get back the family members on the one-week space and the others move along. Hence, a minor challenge in the game is managing your pieces to make sure you can take the actions you want when you want.The fourth action is to corral some tourists for your resort by placing a family member on a section of a boat. If you chose this week’s boat, you get the tourist pieces immediately—as long as you have chalets for them—and your family member returns at the end of the turn. However, you can also take tourists from a future boat (they’ve booked in advance). 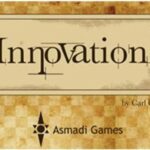 These go on a track on your own board and move up each turn. In this case, you need to have chalets available when they arrive and you don’t get your family member back until then. Again, planning is needed and this tends to be done later in the game rather than at the start. Money is an important factor in both games. 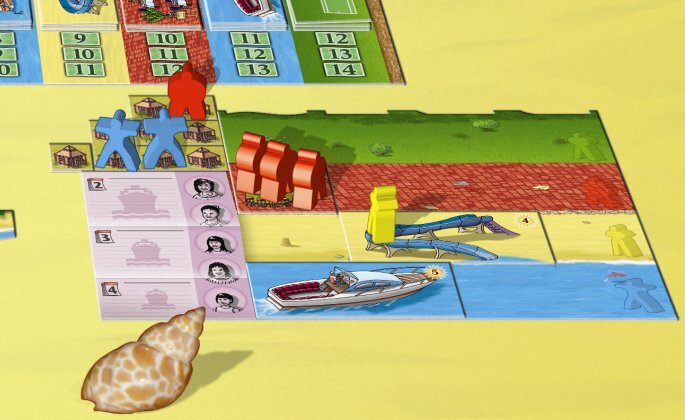 In Sun, Sea & Sand, you get income for each occupied chalet at the end of the turn. However, tourists only stay one turn unless you have attraction(s) of their colour to keep their attention. The most useful attraction in the short term is thus the bar, which doubles the income from tourists in it. 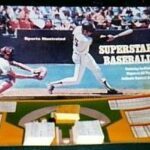 It’s also the only attraction of which there are enough for every player to have one. The key thing to note is that there isn’t much money around and you will need to save up to get the more valuable attractions. There is a bit more money available in Key West. For a start, one of the actions simply brings in cash. The “diving” action can bring players money, too. When diving, players turn over tiles at random and keep some: sponges are worth cash, wrecks score victory points (more points the later in the game the wreck is revealed) and treasures will be worth points at the end of the game. Shares in the bridges that connect the islands with each other and the mainland bring in a little cash as well. Players take a share in a bridge (and the money) by taking the appropriate “Key West” tile. Players also get some change when running hotels, though this is more involved. First, you must use the ‘buy hotels’ action to buy a hotel. The ‘buy and manage hotels’ action lets you buy a hotel and produce income. However, only hotels on islands connected to the mainland (the bridges are completed when all the shares have been taken) provide an income. You roll one die for each island group in which you have a hotel and the highest die is the income from each of your connected hotels. Every five points of income scores a victory point and any balance is taken as cash. Since I’ve mentioned some of the ways to score points in Key West, let me go through the others. 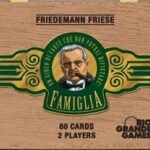 Cigars bring in victory points: the “buy factory” action lets you buy a factory, the “cigar rolling” action produces cigars from factories (rolling dice in the same way as when managing hotels) and then “cigar marketing” converts cigars to victory points. If you have shares in the bridges, you can take the “score shares” action to get victory points from them. At the end of each turn, there are a couple of points for the player with the most pieces on each group of islands. This is a very useful bonus, especially if you can score it for several turns. As well as hotels and factories, players may gain plantations. These come from the Key West tiles, rather than being bought, and other tiles make harvest tokens available. Players can use the “harvest plantations” action to take tokens that match their types(s) of plantation. At the end of the game, they score victory points for each type of token, according to how many they have. Treasures taken when diving score the same way and each $5 left is worth a victory point as well. Finally, players are ranked according to for the ‘star rating’ of their set of hotels and get points for their relative positions. By contrast, money is worthless at the end of Sun Sea & Sand, so it makes sense to spend it all. Players’ points come from the tourists, signs and attractions in their resort. There is a little bonus for the discrete empty spaces between attractions, adding a Tetris element to placing attractions on your board. However, most of the points scored will come from the attractions. As it turns out, the themes of the two games are not as close as they appeared. Key West is about the development of the islands as a whole, including the tourist trade. Sun, Sea & Sand is on a smaller scale, concentrating on one island and the development of rival tourist resorts. Their approaches are different too. Sun, Sea & Sand has some randomness (which tourist boats are in the game in what order), but no chance factor in the game play. Key West, on the other hand, has plenty of luck: all those tiles and some die rolling. Both games provide some interesting tension between specialising and generalising. Key West offers advantages for specialising: pick up some diving bonuses and diving will be a big part of your game. 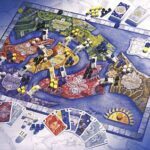 At the same time, it’s expensive to use the same action twice in three turns (and there are only eight turns, remember), which pushes players towards doing a bit of everything. My experience so far is that some players will go diving, some will make cigars and some will grab plantations. 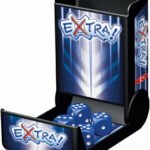 Everybody will buy a few hotels and there is a big battle over these in the last couple of turns as players eye up the final bonuses. In Sun, Sea & Sand, the question is about colours. Once you have an attraction, tourists in this colour become more valuable as they will stay longer in your resort. In turn, this provides an incentive to buy more attractions in the same colour. However, most tourist groups are a mixture of colours, so buying attractions in 2-3 colours will pay off. You also have to take into account that you have limited space for attractions and the number of each attraction is limited. I have to say that I have enjoyed playing both games though they ‘feel’ very different. Key West is more about tactics—taking advantage of the tiles that turn up—and luck, especially if you go diving. Planning is still an important part of the game, but so is chance. 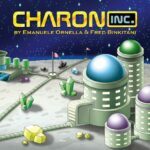 The auction provides some player interaction and, later in the game, players will take plantations, factories and, especially, hotels from each other (though this is balanced by having to pay for them). In contrast, Sun, Sea & Sand is more strategic, with little left to chance. (I should mention the ‘backpackers’: one tourist on every boat that wanders round the island until it finds room. This can disrupt your plans, but is only a minor element in the game.) Players compete for tourists, but generally develop their resorts separately.